DULUTH, Ga.-(BUSINESS WIRE)-Feb. 2, 2016: AGCO, Your Agriculture Company (NYSE:AGCO), a worldwide manufacturer and distributor of agricultural equipment, reported net sales of approximately $2.0 billion for the fourth quarter of 2015, a decrease of approximately 21.2% compared to net sales of approximately $2.5 billion for the fourth quarter of 2014. Net sales for the full year of 2015 were approximately $7.5 billion, a decrease of approximately 23.2% compared to 2014. Excluding the unfavorable impact of currency translation of approximately 13.0%, net sales for the full year of 2015 decreased approximately 10.2% compared to 2014. 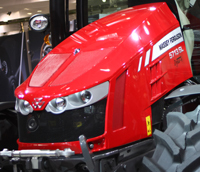 “In the midst of challenging market conditions, we worked aggressively in 2015 to better align our costs and working capital with the weaker demand environment,” stated Martin Richenhagen, AGCO’s Chairman, President and Chief Executive Officer.